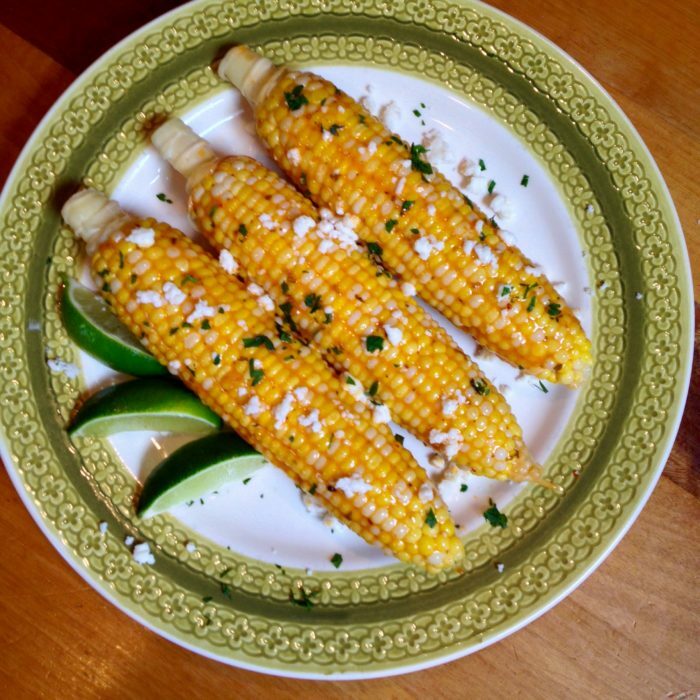 This corn recipe is inspired by elote—traditional grilled Mexican street corn that is cooked, then basted with a mayonnaise and butter mixture then rolled in grated cojita cheese. We have streamlined it a bit and added hot sauce. It’s not a slow cooker recipe, but I think you’ll enjoy it anyway—my teenage boys have asked for this corn several times since I first made it. Plus, it would make a good side for something slow cooked, like Italian Beef Sandwiches. If you happen to have bountiful amounts of corn and other summer vegetables, here’s another recipe I created to showcase end-of-summer produce: Sweet Corn Salad with Herbs and Feta. Place a large pot on the stove 3/4 full with water, over high heat. Bring to a boil. Add corn and cook for 5 minutes. Transfer cooked corn to a platter. Melt the butter and whisk it together with the hot sauce. Put the cheese on the plate. Brush each ear with the butter mixture and roll it into the cheese. Transfer corn to a platter, sprinkle remaining cheese and herbs over the corn. Season with salt and pepper, if needed, and garnish with lime wedges.